1. Snip the fat of the gammon several times and cut each in half. ￼Place on a grill rack under a preheated grill for 3-4 minutes each side. 2. Meanwhile, mix the cheese, onion, egg, mustard, Worcestershire sauce and larger (if using). 3. Spoon the rarebit mixture on top of the gammon and grill for a further 5 minutes until golden. 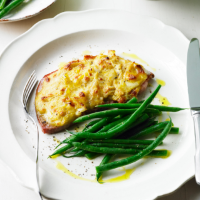 Serve with new potatoes and green beans, if you like.